Le Sarpé is a brilliant restaurant – it’s moved on from just traditional Savoyarde cooking – which it still does very well. Now, it serves fine adventurous French cooking in charming, atmospheric, traditional surroundings. 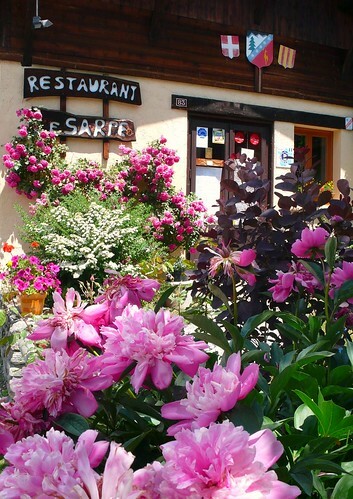 It’s in Les Bois, tucked away in a quiet old street just a pleasant ten minute walk through the woods from Les Praz. There’s a pretty private garden out the back for warm summer nights. Do you know the e-mail address for Le Sarpe as i would like to book a table. Hi Eric – they don’t have email I’m afraid, so you can only book by phone. Discover our part of Chamonix with ê this gite outline, a beautiful chalet with hot tub, sleeping ten within walking distance of the lift. Les Praz de Chamonix. © 2011 All rights reserved.